The students of hadeeth know why i have mentioned these two names. "After the Prophet had died, and Abu Bakr was made his successor, there were [some] Arabs who turned to disbelief. `Umar (radhiallahu `anhu) said: 'Oh Abu Bakr! How can you fight the people when the Prophet of Allah (sallalahu `alayhi wa sallam) has said: 'I have been ordered to fight the people until they say: 'There is no God but Allah' and whoever says this, makes himself and his property inviolable except by legal right, and his reckoning is with Allah?' Abu Bakr replied: 'By Allah! I will fight whoever differentiates between salah and zakat , for zakat is a lawful right upon the property (that Allah gave)! By Allah! Were they to withhold even a single animal that they used to give (as zakat to) the Prophet of Allah (sallalahu `alayhi wa sallam) , I will fight them over their withholding it'. Then `Umar (radhiallahu `anhu) said: 'By Allah! I saw then that Allah had opened the heart of Abu Bakr to [the cause of] fighting, and I realized then that it was correct". “We obeyed RasoolAllah as long as he was amongst us. Yet what is the hakimiyyah (rulership or right to rulership) of Abu Bakr? Notice how these people self interpreted the verse? They used their own `aqal and own intellect to understand the verse of qur`an even when the sahaaba upon whose lives and situations these verses were revealed were alive and standing in front of them ! This is the audacity of the ignorant who self interpret qur`an and hadeeth, leaving the understanding of the scholars and fahm of salaf. “Indeed the dunya (world) is kafir. The delegates on the face of the earth have seen you are little in number. You do not know if they will come upon you during the night or the day. The closest ones to you are in a distance of one barid. They hope that we accept their salah and the fact that they will not be giving zakah but we did not accept this proposal. Do the needed preparation (of a war) for them. They may attack you.”… The tribes of Bani Zubyan and Bani Abs attacked the Muslim who lived among them and killed them. The rest of the tribes did the same thing. Upon this Abu Bakr had made an oath to kill an equal amount or more from the tribes which had killed the Muslim. “Urwa and the rest narrated: Abu bakr (radhiallahu `anhu) had set off with an army constituting from the muhajiroon and the ansaar. He came to a place called Nak aligned with the area of Najd. The badawi took their children and ran away. Abu Bakr made a consultation with those with him. They told him to return to Madeena to be with the children and women and to appoint someone else to lead the army. He appointed Khaled ibn Waled and returned. Before leaving he told Khalid to allow those from among the murtad who returns to Islam and pays zakah to retun to Madinah. And he was sent off. “The sahabah did not ask them if they believed it was fard or if they did not believe so. An approach as such has never been narrated by the sahabah. On the contrary As Siddiq (radhiallahu `anhu) said to `Umar (radhiallahu `anhu): “Wallahi if they withhold a goat they used to give RasoolAllah I will fight them for this reason. 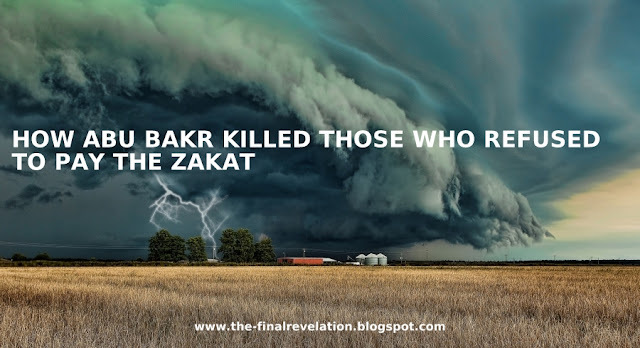 As seen Abu Bakr (radhiallahu `anhu) he did not give the disbelief of zakah as a reason of war he gave it for not giving it. Likewise it had been narrated that a group from among them did believe it was fard to pay zakah however avoided giving zakah. In spite of this the attitude of the Caliph towards them had always been the same. This attitude had been that their warriors are killed, the families are taken as slaves, and their estates are confiscated as spoils also the shahadah (testimony) that their dead will go to jahannam. Furthermore he had characterized all of them as ahl ridda (people of apostasy). Thus the greatest virtue of Siddiq (radhiallahu `anhu) beside them had been the fact that Allah had made him determined to fight the murtadeen (apostates). He had not hesitated like others on the contrary he argued (and debated) with them and made them (the Muslims) accept his view. Among the sahabah there had been no argument regarding the matter of fighting against them (the group of Musailamah the false prophet). This (action of the sahaaba) is a hujjah against those who say " If they go to war with the imam to not give (Zakat) they will become kafir, otherwise they will not be (kafir).